Book Rashad Babaev for your camp or lecture. Rashad was born in Baku, Azerbaijan. He became a Grandmaster in 2007 and is the winner of many International tournaments. As a young player he had esteemed coaches, including Oleg Privorotsky, the teacher of World Champion, Garry Kasparov. He has attended seminars of World famous chess coach Mark Dvoretsky in Moscow. In order to improve your game, you must study the endgame before everything else. Jose Raul Capablanca World Champion. In this 6-hour chess endgame course, experienced coach Grandmaster Rashad Babaev trains you in the skills you need to successfully master the endgame. Master the principles of practical endgame play, learn how to win with dynamic sacrifices, dictate the transition to the endgame and much more. I know Rashad from our childhood. We grew up together and played many interesting games. Rashad was very sharp, active, creative chess player and he had attitude to win the tournaments he was playing in. His strong character, high skills and passion were leading him to win many tournaments. Besides his practical achievements, Rashad also known as a great coach. He has big contribution to Azerbaijan and World Chess. He has trained many strong chess players. He is also known as an expert in some opening lines, such as KID. I can characterized Rashad as a good friend, talented, honest, and very responsible person. In the decade that I have known him, Rashad has shown himself to be a very energetic and active person, both on the chess board and in life. His approach to teaching reflects his own unique and interesting style and understanding of chess. 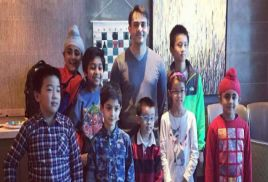 In my years of teaching chess in NYC, I have heard many positive feedbacks about his coaching from students and fellow teachers. I wish him all the best and success to his students! After Jason participated in a camp taught by GM Babaev early 2017, GM Babaev started giving Jason weekly online lessons immediately because we were very impressed by the passion and knowledge of GM Babaev in teaching. Jason was able to improve his USCF rating from 1800 to 2100 within about 12 months. GM Babaev has helped significantly to improve Jason in chess opening, positional understanding, strategic ideas, and many more. We are fortunate to have GM Babaev teach Jason profession chess! Rashad has always done great work for Chess.com! His video lectures are top quality, and his reputation as a quality chess trainer precedes him! Rashad has coached my son for many years. He has inspired a love of the game that has sustained my son through many tournaments and other chess activities. We appreciate his attention to both chess tactics and other aspects of performance. Thank you!